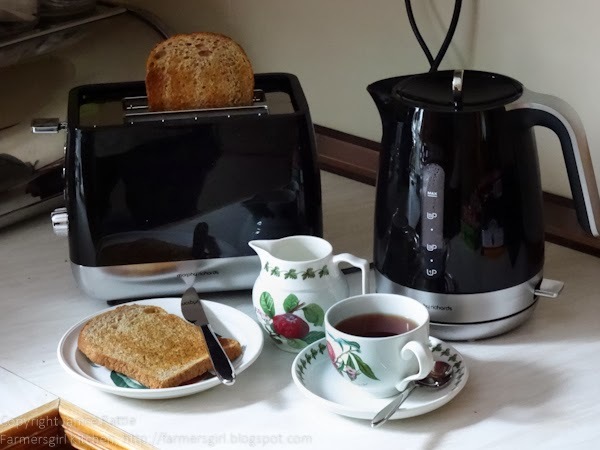 Farmersgirl Kitchen: Tea and Toast with style! There are some pieces of kitchen equipment that we simply take for granted. 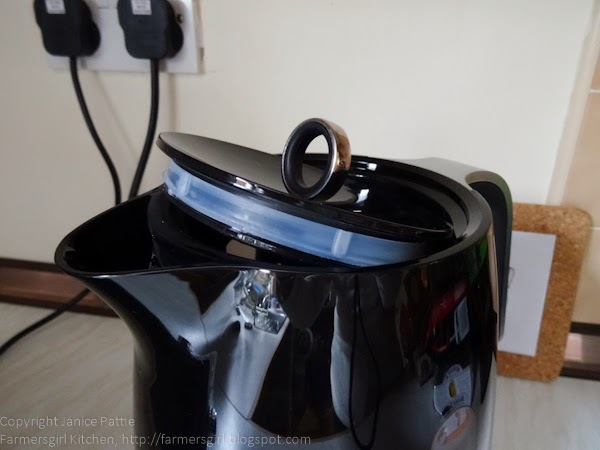 How often do you boil the kettle? I know that mine is on many times every day, not just for tea and coffee, but to boil water for vegetables or stock as well. This Morphy Richards Chroma is a sleek, modern jug kettle in shiny black and silver. It's fast boil and surprisingly light. I really loved the lid which isn't the usual hinged type but lifts right out with a ring handle and a good seal around the top. The cup measurements are really clear on the side too. 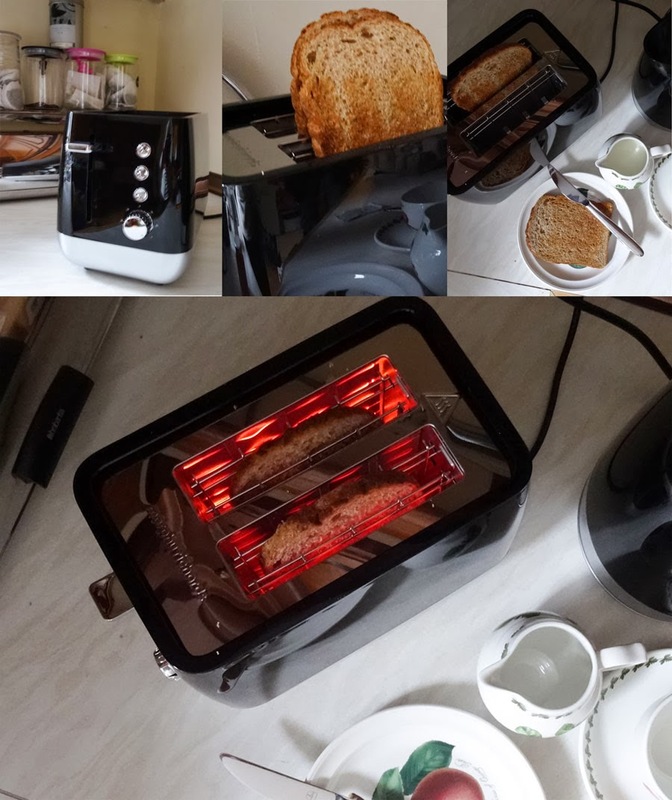 The Morphy Richards Chroma 2 slice toaster has good clear controls with a range of heat settings. It toasted evenly and quickly, great for breakfast toast or a quick snack with cheese. Both items did the job you expect with the minimum of fuss and the maximum of style and get a big thumbs up from me! Thanks to Morphy Richards for the kettle and toaster to review, I was not paid for this review and all opinions are my own. Many thanks too, to my friend Avril for the use of her kitchen and beautiful Portmerion Pamona crockery as I have major building work going on in my house! Love the word swish, haven't used it for years, but it is so descriptive. Avocado on toast with Salt & pepper - divine! Lurpak! I don't think there's anything better!! that looks very smart. Tea and toast is something I can get FAR too addicted to! I'll pop your giveaway in The Food Blog Diary for you Janice. This set looks great and I'm crossing everything to win as both my kettle and toaster are broken! Our toaster is on the blink and our kettle ancient, so I shall cross fingers for this one. I love toast and eat a lot of it. Hot chilli sauce is one of my favourites for breakfast - it wakes me up. I love real butter on my toast! 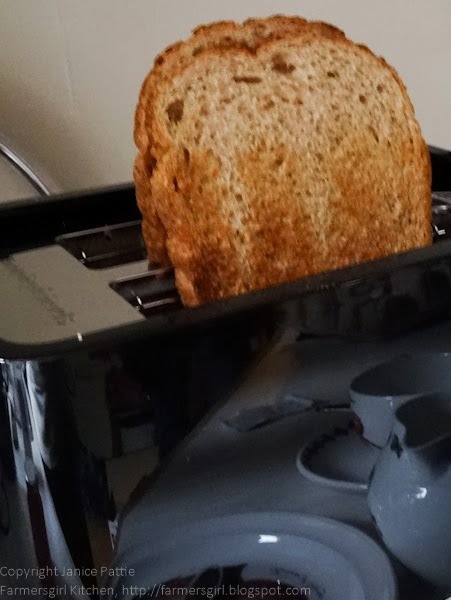 This stylish toaster will look perfect in my kitchen, while I enjoy my toast with homemade salted butter in the mornings. Butter with lemon & lime marmalade. Real butter and strawberry jam. Welsh butter & Seville orange marmalade does it for me! Peanut butter and strawberry jam-in fact iv just finished some! Always one slice of Marmite and the other with my Dad's Marmalade! Peanut butter, although OH hates it so I try not to sit too near him, lol. I Love To Spread Orange Curd On My Toast In The Mornings Yum! I love to spread lime marmalade on my toast. My favourite thing to spread on toast is pâté, but I usually just have butter, which i also love. marmite much to my husbands annoyance! Butter!!! Love to keep it simple! I love the colour, it would fit perfectly in my kitchen. I like butter on toast, lots of it.. real butter. I love marmite on toast done the Nigella way - mix softened butter and marmite together, then fridge it til it's nearly set before spreading on hot toast....mmmmmm!! Cheese and marmite is a brilliant toast topping. Marmalade too. I have to confess I'm a marmite lover. Nutella. I add toast to my nutella rather!! I like to spread Anchor butter on my toast. Yummy. I love savoury toast so I go for Marmite or Pate. My absolute favourite which I occasionally treat myself to is loads of good quality unsalted butter. Just plain butter for me! On white bread I like butter and strawberry jam. On granary I like marg and lemon and lime marmalade. In fact I was daydreaming about that just yesterday! always real butter :) and lots of it! I like to spread laughing cow cheese triangles on my toast instead of butter, delicious! peanut butter and thinly sliced bananas. Same as my pancakes, and everything else.... Nutella!